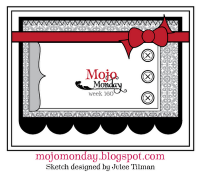 Another Mojo monday and I’m really sleepy. 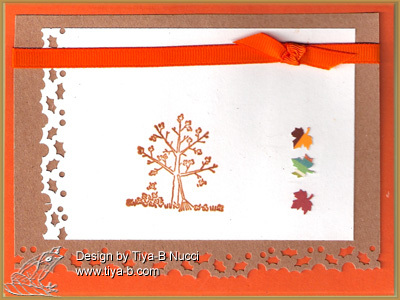 The sketch is mojo mondy below, the stamp from stampin up and the punch a Fiscars, i love this season so another fall card. 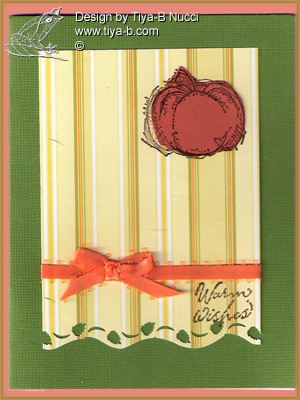 Its drizzling this morning so its fitting o a pumpkin for the fall seems fitting up’s Windows on the world and Autumn harvest, the punch(leaves on the bottom) is Fiscars, the paper is from a dcwv stack. 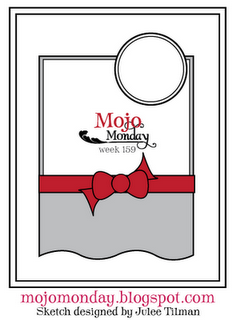 Another mojo challenge and a timeless tuesday one too. Here is a picture of my favorite chihuahua. 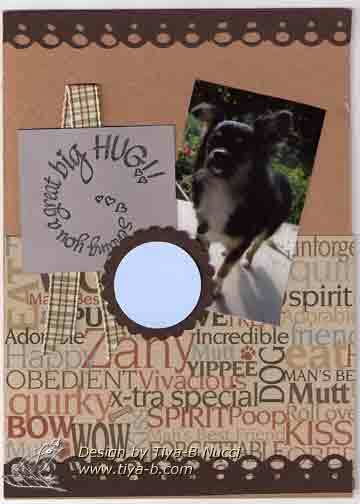 I used spellbinder cuts for the circles, the stamp is by stampendous, the background paper is from the shelf and called couud 9 design dog collection and the punched top and bottom border is from a fiscar punch. the chihuahua is Sisi my lovely model. 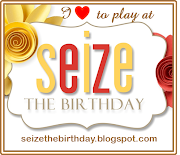 I’ve had enough fun with valentine themes and punches so I think ill stop!’ and the fact this is valentines day has nothing to do with it. 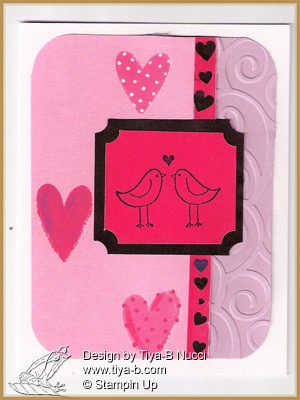 This stampin up love bird set is too cute. 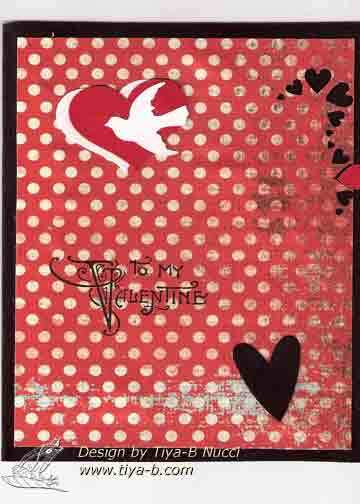 Cuttlebug background swirls and the punched hearts frome fiscars side punch completes the card. 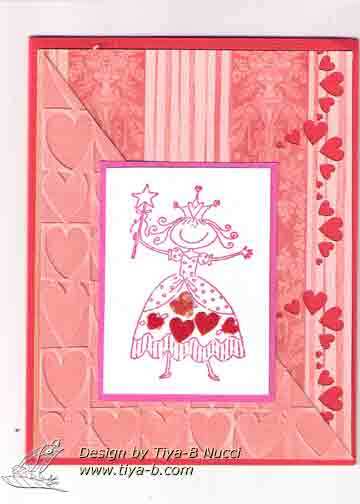 Another heart theme… the web site Quietfire gave a challenge for a queen of hearts card. 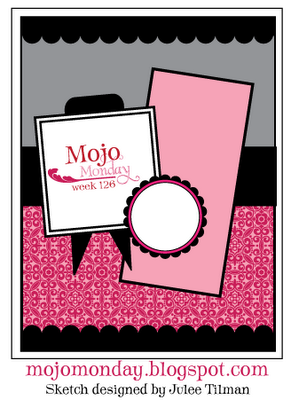 I know is alice in wonderland theme but i dont havew any queen stamps so a princess is the closed so here it is. I used cuttlebug hearts and my favorite heart punch is the fisdcars on the side. ( i glued little hearts on her skirt since it had flowers and not hearts. 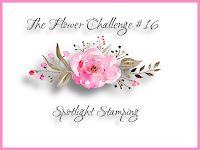 the Stampin Royalty challenge was a valentine so I got to make another mostly punched valentine. 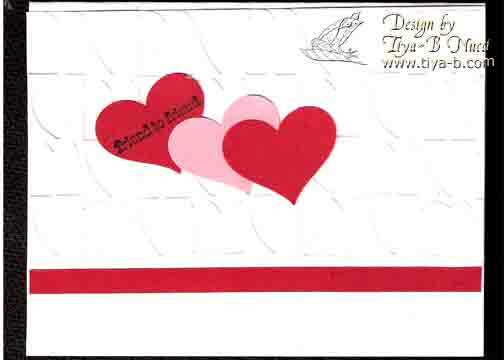 the bird is Martha Stewart, the medium hearts are Fiscars as are the tiny ones on the edge and the skinny one is Stampin up. The stamp is stampendous. I love cuttlebug and punches…. why do i have so many stamps?